Posted January 27, 2018 by Helena & filed under Travel. This segment will focus on Vietnam and Cambodia. I’ll cover Thailand in a future post. We only had a week in Vietnam, but we could’ve happily spent a full month there. So much to see and do! We were there during the month of January, which meant the evenings in Hanoi were chilly — a warm jacket was necessary, especially since a side trip to Ha Long Bay was part of the journey. But it was really hot and humid both day and night in Ho Chi Minh City, in the southern region of the country. Go to Hanoi! It was probably my favorite part of Vietnam. Hanoi is crazy and it’s also charming. The people are friendly and the food is DELICIOUS. In Hanoi, stay at the Sofitel Legend Metropole if you can. It’s a hotel with so much rich history. We stayed in their elegant Metropole Wing, which has stately dark wood furniture, toiletries from Lanvin and a whiff of the French colonial era when service was impeccable. They also have a modernized art deco wing, but the historic Metropole Wing transports you to the past. The hotel offers a free evening tour of its grounds, including the bomb shelter underneath the patio – it was used during the Vietnam War, which is known over there as the American War. Makes sense. We actually skipped out of the tour a little early because we were itching to go get pho. The hotel has THE MOST AMAZING CHICKEN PHO! Their café, Le Club, serves delicious pho (clean, elegant flavors), along with tasty treats and drinks in an classy setting. If you get the hotel’s breakfast buffet, they offer both Asian and European foods, so you can get your fill of dumplings, pho, croissants, fruits, good coffee, etc. But the pho served at Le Club café is out of this world. The best I’ve ever had. 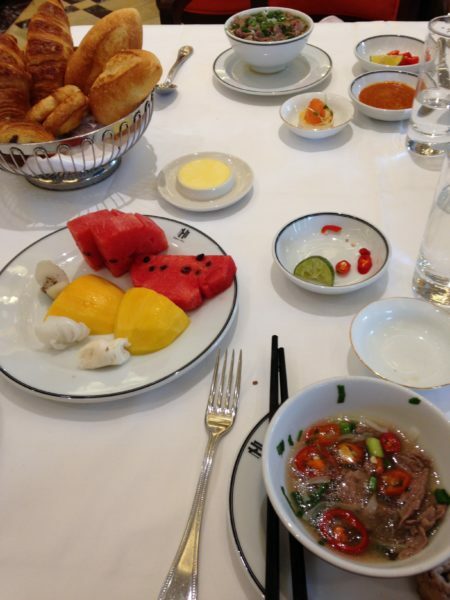 Vietnamese and French breakfast fare at the Sofitel in Hanoi. The Geno in the background, looking very happy with his breakfast. The pho station is in the foreground. If you can tear yourself away from the pho at the Sofitel, there’s a legendary pho spot: Pho Gia Truyen on 49 Bat Dan street. At night, do a food tour with Hanoi Street Food Tour. They pick you up on scooters, which is the most popular mode of transportation in Hanoi. So it’ll be one guide + one tourist on each scooter. Warning: you will fear for your life while on the scooter, and then you will be rewarded with amazing foods. The drivers in Hanoi (including your guide) have absolutely no regard for traffic rules, so your American sense of order and safety will be jangled. However, you will eat amazing street foods. We stopped at about six spots, the standout being a sidewalk establishment serving fish noodle soup. We could totally imagine Anthony Bourdain enjoying the bowl of spicy, piping-hot soup with slippery/chewy noodles. The tour also takes you through the old French Quarter as well as an old railway that is now open only to pedestrians and motorbikes. The tour is about $45 per person. Well worth it! My Tripadvisor review is here. 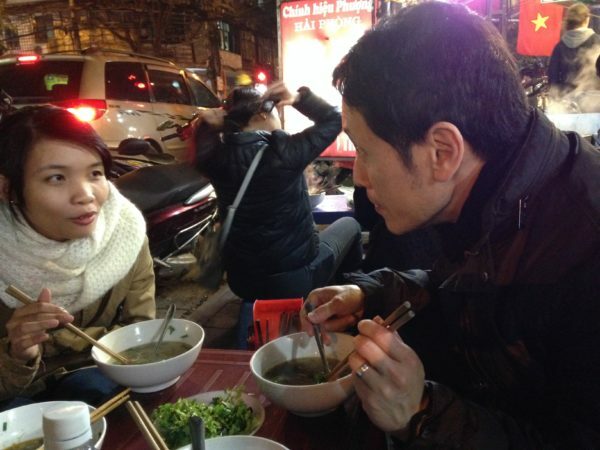 Enjoying fish noodle soup during the Hanoi Street Food Tour. 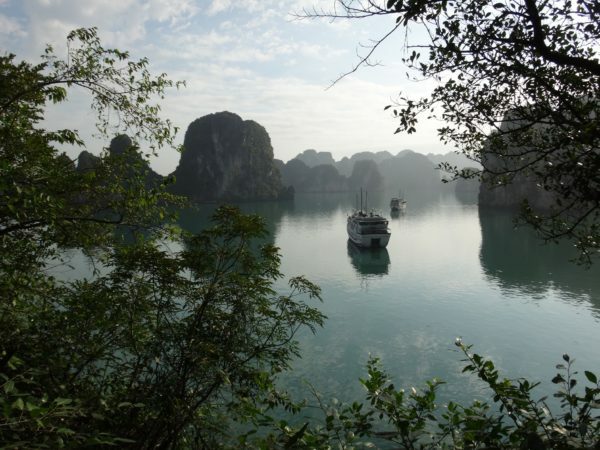 Don’t miss Ha Long Bay. After much research, we went with the company Indochina Junk Co. because they have a beautiful ship called the Dragon Legend and they also apparently navigate through waters that are less crowded. This all proved true, and not only that, their food was REALLY good. My only complaint is the forced stop you make on the shuttle ride back to the hotel – you stop at a strange restaurant/business that puts on a water puppet performance in hopes of selling you their treats and wares. Sounds hilarious, because it is. Apart from that, everything was perfect and in some parts, the limestone pillar islands in the bay truly made you imagine the back of a dragon as it dives into the water. We hiked up an island and took this shot of our ship, the Dragon Legend. 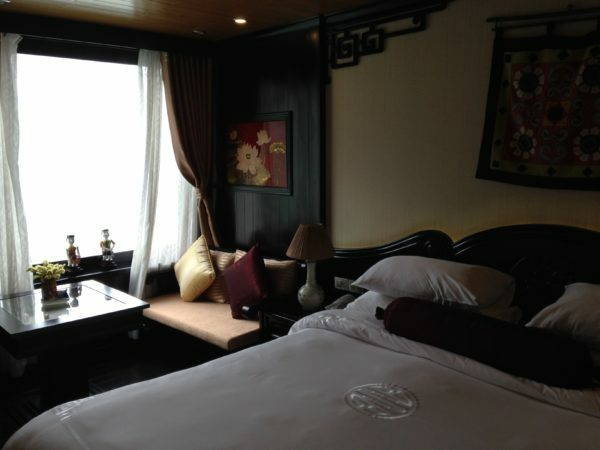 Our room on the ship, the Dragon Legend. 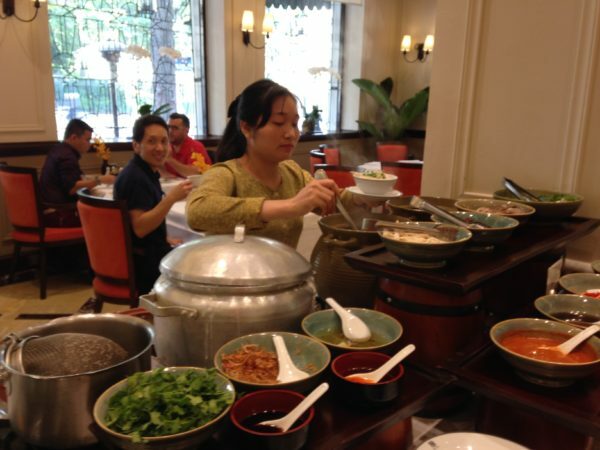 A quick note: Hanoi is known for their coffee – in particular, egg coffee. This sounds intriguing, but I didn’t love it. If you like thick, syrupy consistency for coffee, then go for it. I found it too rich and sweet, like pouring molten sugar down my throat. Gag. Here’s my Tripadvisor review about the experience. One of my good friends spent a Fulbright year in Vietnam, so he highly recommended that we contact his buddy Hien, who works as a tour guide in Ho Chi Minh City. We’re so glad we did! We were originally supposed to do a night food tour of Ho Chi Minh City with Hien, but the Geno got a bad case of the flu and couldn’t stomach anything, so we had to cancel unfortunately! We’ll have to go back for it someday! But we did end up going to the Mekong Delta and the Cu Chi Tunnels with Hien. Most tour companies will not do both spots in one day, but Hien made it happen! The Mekong Delta is a must see. My dad was in Vietnam during the war (he was a South Korean soldier hired by the U.S.), so I was really interested in this area since he’d spent several years there. For me, the Mekong conjures up memories of reading books like Robert Stone’s “Dog Soldiers.” And of course, watching the movie “Apocalypse Now.” There’s so much mystery surrounding this enormous waterway. Hien took us to a fantastic restaurant near the river where we had an enormous puffy rice ball that collapsed into chewy morsels. 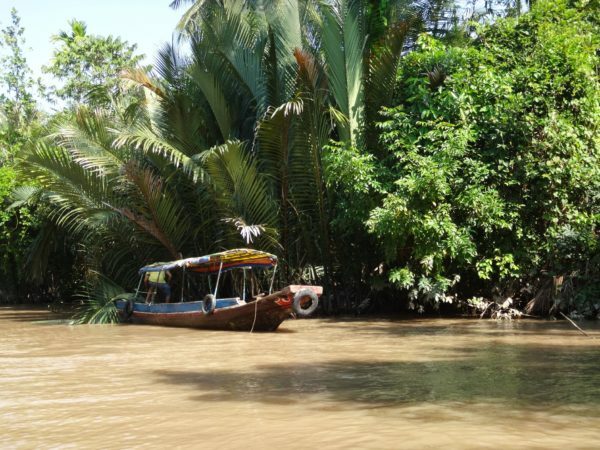 We also rode a boat through the very wild and overgrown vegetation of the Mekong. Really eerie and magical. A boat ride on the Mekong. 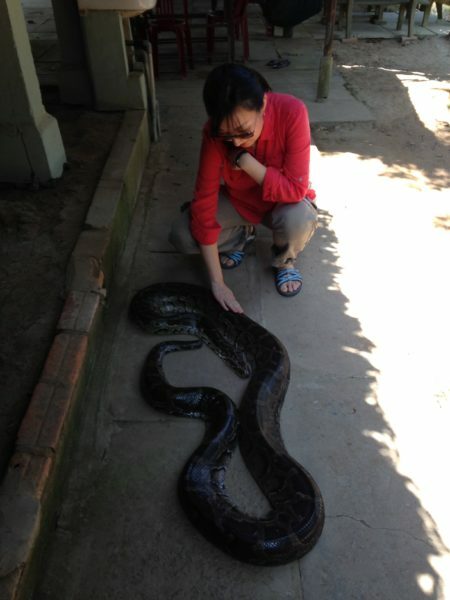 Met a giant and gentle snake from the river. What can I say about the Cu Chi Tunnels without sounding controversial? Go see them for yourself. The Viet Cong used these tunnels to wage stealth warfare on American soldiers, and I can understand why war vets refuse to visit the tunnels…there are instruments of torture and tools for death on display. However, now that I’ve been, I can definitely say that the ingenious network of tunnels are a testament to mankind’s resilience, patience and deadly determination. I’ll leave it at that, since everyone should form their own opinions. 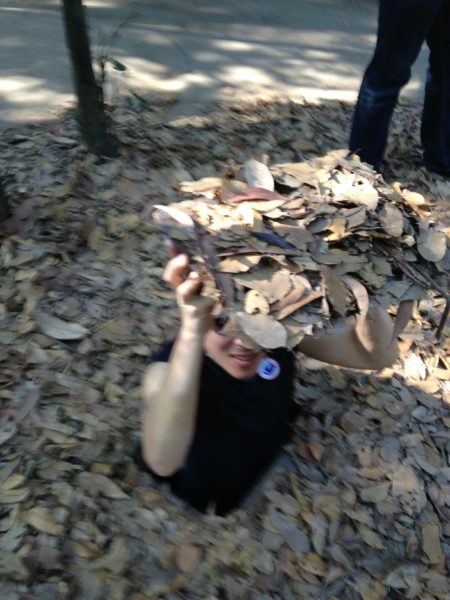 The Geno climbs into a hideout spot under leaves at the Cu Chi Tunnels. If you’d like Hien’s contact info, email me via the contact page, and I’ll let you know his coordinates. He does food tours as well as customized travel tours. He is VERY knowledgeable about the history of Vietnam and will spoil you with local fruits and delicious foods – for instance, on the morning he picked us up for our tour, he stopped by a bakery to get paté baguette sandwiches for us, and they were out of this world. Apparently, it’s common in Vietnam to use both rice and flour to make baguettes, which makes for a very light, chewy crust. Yum! Here’s my Tripadvisor review of traveling with Hien. 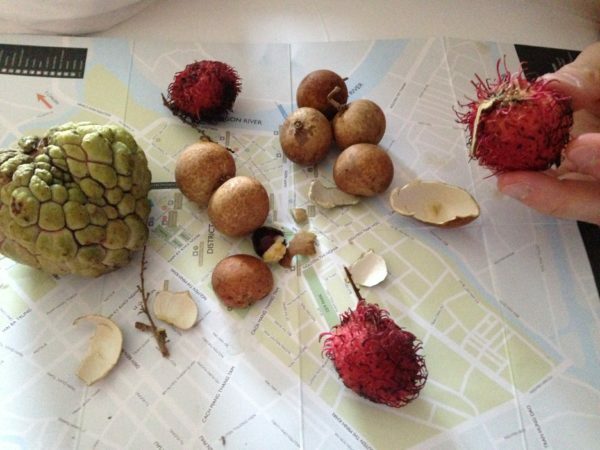 Fresh local fruits we ate on the drive with Hien. Ho Chi Minh is a fun city to walk around, with an eclectic mix of French colonial and Vietnamese architecture. 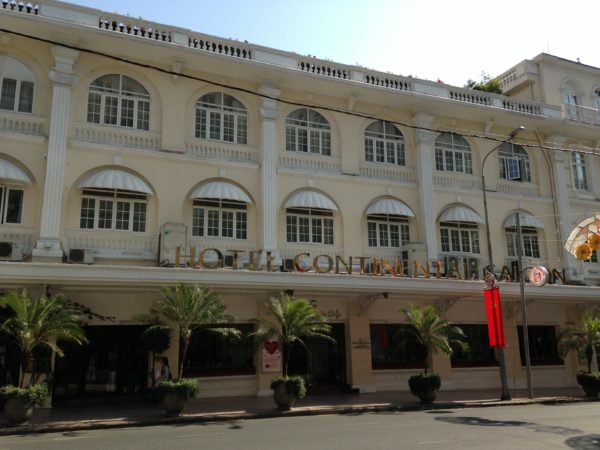 The Hotel Continental is a great place for afternoon coffee or tea, and I believe that’s where Graham Greene wrote part of “The Quiet American.” Years ago, I started writing a novel set in colonial Vietnam (French Indochina) because I was inspired by Marguerite Duras, who once lived there…maybe I’ll finish it one of these days. We were in Cambodia for only three days, so I’m no authority on travel through the country. We had one goal: to see Angkor Wat. But someday, I’d like to go back to explore other parts of the country. We knew that places like Phnom Penh had an extremely troubled past that still reverberates today, and I guess we just weren’t in the mood to see places like the Killing Fields. I know people who’ve done great service work to help Cambodians, such as my brother, and somehow, it just didn’t seem right to partake in consumer travel through areas where the suffering is still so apparent. 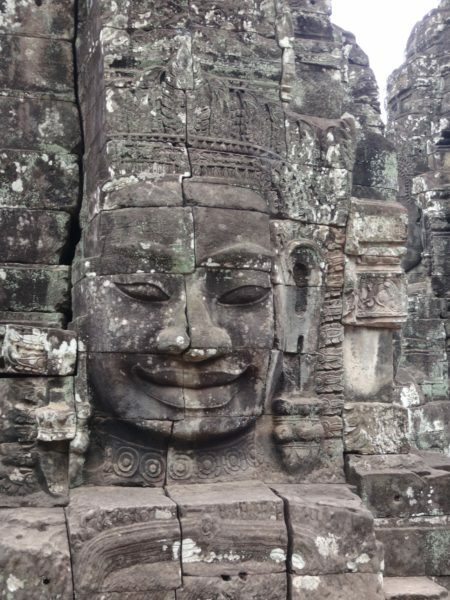 So we spent all three days in Siem Reap, home of the UNESCO world heritage center Angkor Wat. Be prepared to be amazed at Angkor Wat. 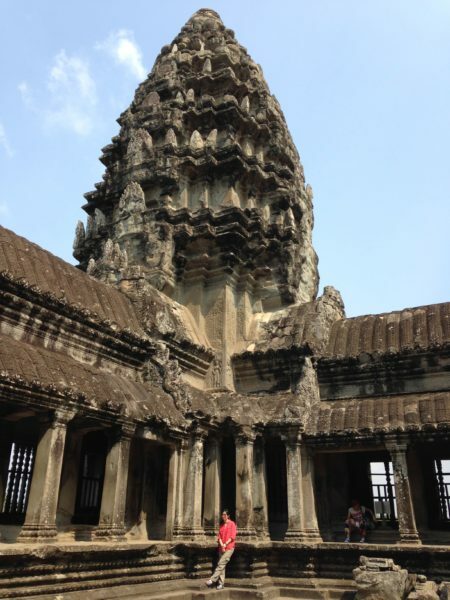 Angkor Wat is a must see! You’ll feel like Indiana Jones or Lara Croft. I highly recommend hiring a guide, because the grounds are ENORMOUS, so much bigger than I’d imagined, and you will definitely miss the key parts without a knowledgeable guide. We went on an all-day tour with charming Mr. 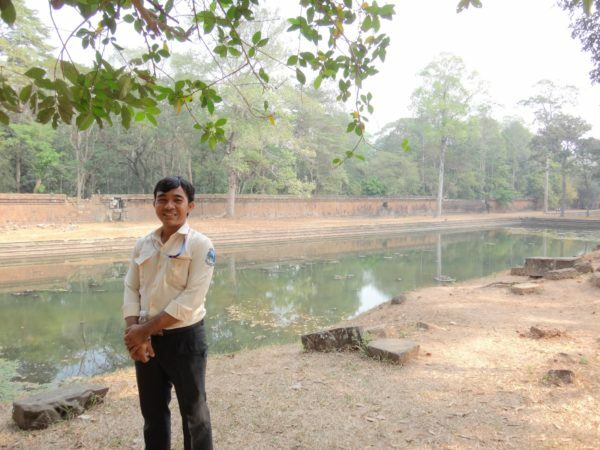 Tea of Angkor Wat Day Tour. He was so fun, funny and cute. Just an adorable button of a guy. Very pleasant and full of energy, he took us to all the best spots and answered all our questions about the history of the place. By this time, the Geno was in full flu mode, so Mr. Tea made sure we made regular stops for fresh coconut water. Here’s my Tripadvisor review. If the Geno hadn’t been so ill, we would’ve done the Siem Reap Food Tour, which gets rave reviews. Instead, we went to a few of the local restaurants. The standout was Il Forno. An Italian guy owns the place, and so you will have excellent pasta for two people for $20. We were amazed. There’s another well-known restaurant we ate at, Genevieve’s, which paled in comparison to Il Forno. If we’d had more time, I would’ve loved to have gone to the Raffles Grand Hotel for the Pan-Asian buffet, which apparently includes excellent Khmer dishes. Travel tip: The dollar goes VERY far in this country. You will be able to journey like a king. Please tip all the service folks well here, because they work so hard for so very little. I definitely want to go back to Southeast Asia! Next time, I hope to add Laos, Malaysia and Singapore to the list if time permits.